Whatever the contemporary global social, cultural or economic problems, it is next to impossible to handle these without using the concept of sustainable development, dating back to 1987 and the former Norwegian prime minister Gro Harlem Brundtland . There is even certain reason to say that the concept of sustainable development goes back to Emmanuel Kant. Indeed, it is interesting to note that Gro Harlem Brundtland’s sustainable development definition coincides well with the Emmanuel Kant’s imperative: never do anything that cannot be converted into a common custom . Sustainable development does not mean some predetermined path of development, but leaves it open for quite a few different choices. From the most general philosophical point of view sustainable development means a maximum trajectory in the development space  of the given object, which would guarantee the longest possible lifetime for the object. The most important of the basic sustainable development aspects is economic for not following either social of cultural aspect, the irretrievable loss may be measured by some deep rooted culture or social structure but still falling short of a global catastrophe for the whole humankind. However, not paying attention to sustainable development principles in economy would be hazardous to the future existence of the whole human race. It means that an especial attention should be focused on sustainable development in economy or in other words on sustainable economy. In its broadest sense sustainable economy means producing order from chaos under the conditions of limited resource flow and waste dumping facilities to satisfy some needs of the population. On the other hand, sustainable economy as a dialectical process has both continuous (evolutionary) phases and discontinuous step (revolutionary) phases, an evolutionary phase to prepare ground for the following revolutionary one. 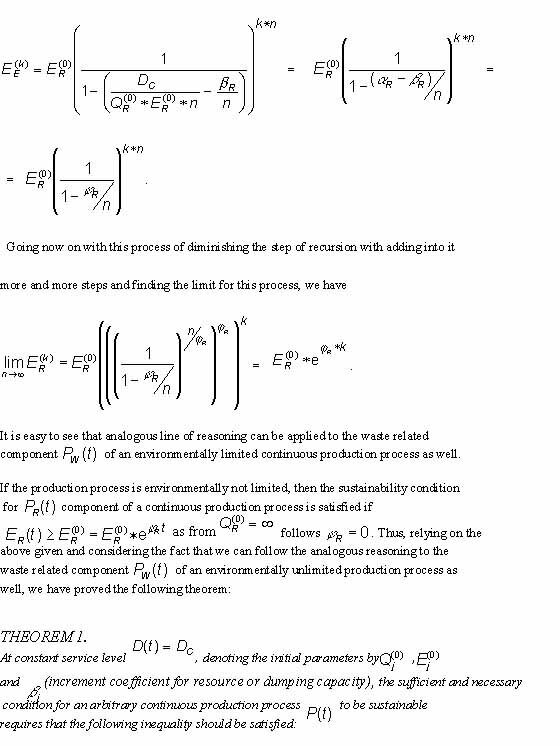 In the following paper, we are going to give a precise mathematical definition for the sustainable economy, based, in principle, on Mrs. Brundtland’s classical sustainable development formulation, requiring to maintain the economic potential at least on the same level for the future generations to come. This definition allows to factor into the sustainable economy concept finite exhaustible resource consumption and environmentally limited waste disposal. 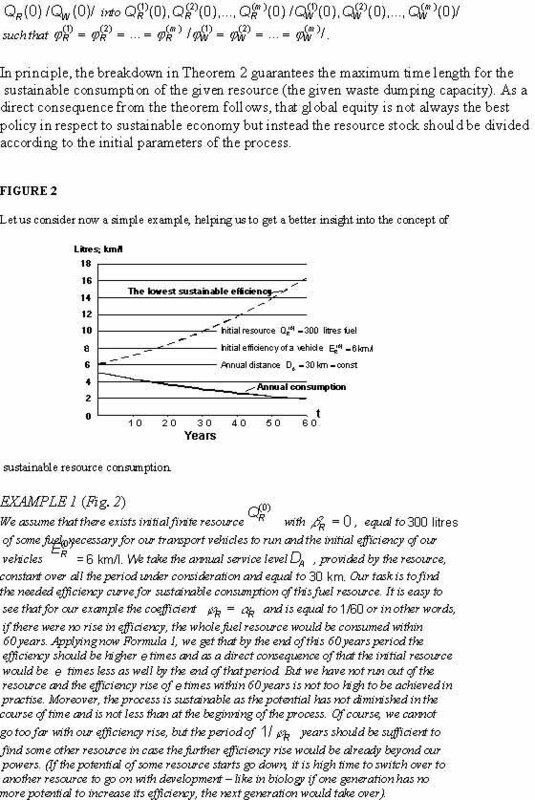 A formula is derived for characterising the needed exponential growth in efficiency to compensate the decrease in finite exhaustible resource and the decline of the waste disposal capacity to guarantee sustainability for the continuous phase of economy. Almost in every sector of human activity, there are two radically different methods of evaluating the situation in that particular area. Either to take stock of the already reached achievements or evaluate the potential for the development in the future. For instance, in sport there has never been much interest in has been top sportsmen if they are already on the wrong side of their best, but contrary to that in science high titles have always been the key factor for deciding, who is better. These two opposite choices of evaluation are in place in economy as well. However, beyond any doubt, the most popular method of evaluating the economic situation has been the estimation of already achieved economic level. There have been worked out rather sophisticated evaluation methods, widely in use nowadays, based on the monetary system in service of the given economy. Unfortunately, if we are to evaluate the perspective potential of an economy, the past achievements alone are not the best indicator of one’s expected success in the future. There is no guarantee that the current progress in economy might not be due to an over-consumption of resources, much more needed in the future. Alternatively, the production processes might contribute with so much non-assimilating waste to the ambient environment that the continuation of the achieved economic level would be blocked in the future. Therefore, if we are interested in a given economy from the point of view of its future development concerning sustainable economic lifestyle, the evaluation should be not based on some monetary parameters, reflecting the achievements, but on a true estimate of its perspective potential [4,5]. We start developing our economy model with a production process as an elementary unit. First, we define the economic potential for a production process, and base on this definition the final notion of our approach, the economic environmental space P(t) as a set function of time for the given economy. P(t) is a mathematical expression of the philosophical concept of environmental space [6,7,8,9]. To produce something within an economy means that we should have to work up some raw material and usually in addition to the needed useful product there is some useless spin off outcome as well. Therefore, there exists always two-sided interaction between the ambient environment and the production process: input in the form of resource stock and the useless spin off output in the form of waste (Fig.1). Whatever one is about to produce in practice, some material resource Qr(t) , available in principle at the time moment t , is needed and there should be some dumping capacity for the production process waste Qw(t) , measured again at the time moment t. As a rule, Qr(t) and Qw(t) are finite functions of time, but in some cases of renewable energy (solar energy, wind energy, etc) the resource can be considered infinite as one cannot influence the potentially available delivery rate of the resource deltaQr(t)/delta(t) through varying the intensity of use. The delivery rate of an infinite renewable resource may be fluctuating but not decreasing in the course of time. An infinite renewable resource is renewable in absolute terms, as this quality does not depend on the resource consumption intensity of the production process, i.e. it is renewable under all circumstances. 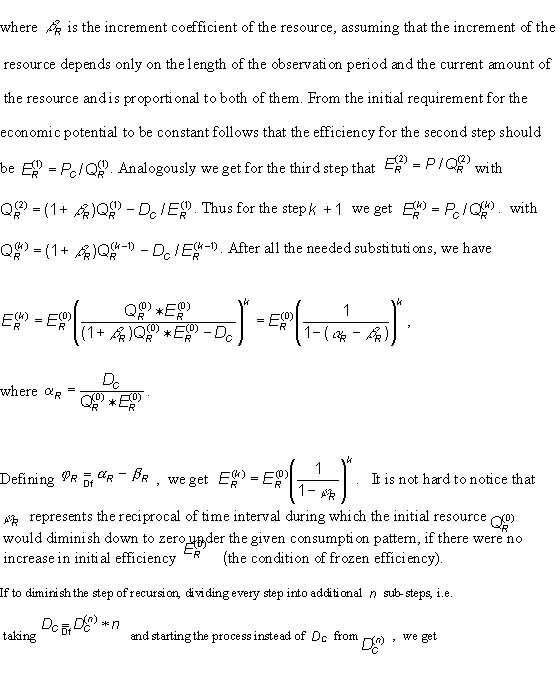 In some cases, the increment of a finite resource Qr(t) can be so small that practically in respect to any consumption rate it can be taken equal to zero. These resources can be considered exhaustible in absolute terms as exhaustible under all practical consumption rates. As an example, in the energy sector, the first case characterises renewables (wind energy, solar energy, etc.) and the second case represents some typical fossil fuel (oil, coal, etc.). But in general, resource can be either a Qr(t) decreasing function of time and therefore exhaustible or in case of the increment exceeding the consumption, even an increasing function of time and therefore renewable. The global economic activities have developed in such a rate that rather many vital resources have become exhaustible and the run out time of these is envisaged already in this new century, if no radical changes are undertaken. Thus, in contemporary economic situation, more often than not, the resource we need for a production process has a finite character projected against the rate of consumption and it will run out if the intensity of use will not wane in the course of time. Concerning production process waste Qw(t) , in majority cases we are not lucky to have a sort of waste with the ability to assimilate into the ambient environment without damaging the quality of the latter in no way. It means that in addition to the problems with running out the needed resource, we are under a constant threat to spoil the ambient environment in terms of qualities needed for the processes, ensuring the continuation of human life. 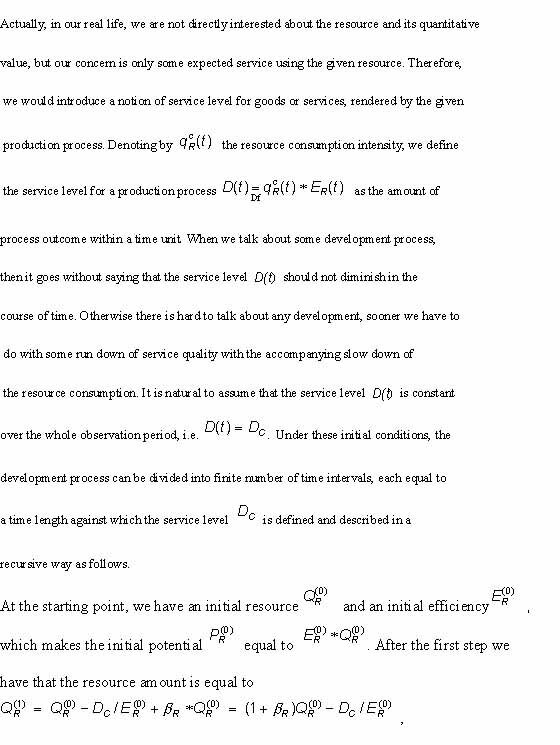 A classification, analogous to the given above to resources, can be applied to production process waste Qw(t) as well. Thus, the disposable waste can be limited either in absolute quantity or only the rate of disposal delta Qw(t)/delta(t) would be limited. We would refer to the former case as to the waste disposal finite capacity. To be precise, instead of having only one resource and one kind of waste related to a given production process, we should consider several resource and waste disposal capacities, i.e. resource and waste are vectors with several components. However, from the mathematical point of view replacing the scalar functions Qr(t) and Qw(t) with their corresponding vectors would make our calculations only more complicated but would not change the situation in principle. Therefore, for the sake of simplicity, not having an effect to the quality of the results, we restrict our approach only with one definite resource and waste per production process. Concerning sustainability criteria for an economy, it is important to analyse production processes, based on finite resource stock and waste finite disposal capacity as the most critical ones. Therefore, in the following we concentrate our main attention to these production processes and call these processes environmentally limited. Resource and waste characterise only the quantitative facet of the interaction between the ambient environment and the production process. Resource Qr(t) in itself is not sufficient to give us a definite answer about its ability to support a given production process. Natural resource as such is not automatically an economic potential to satisfy some human needs. To use a resource, we need first some technology to make the resource useful for our purposes. In other words, we should have at hand some available efficiency to make use of the resource. Thus, resource related economic potential Pr(t) of some production process is the potentially available outcome of the process, measured as the resource together with some technology, making the resource useful to economy. Only the resource together with a proper technology gives us a meaningful potential in relation of human society (before discovering the role of fossil fuels as an energy source, these were useless from the economic point of view). The technology concerned can be factored in by the notion of efficiency being interpreted as an economic efficiency of some engineering technology to render as much as possible needed service, based on that resource. From the mathematical point of view, the resource related economic potential of some production process is measured as a product Pr(t) = Qr(t)*Er(t) . As a rule, Qr(t) and Pr(t) are measured in the units of the production process input and output respectively, Er(t) being in terms of units the conversion coefficient. The economic potential P(t) for a production process is defined as P(t) = . 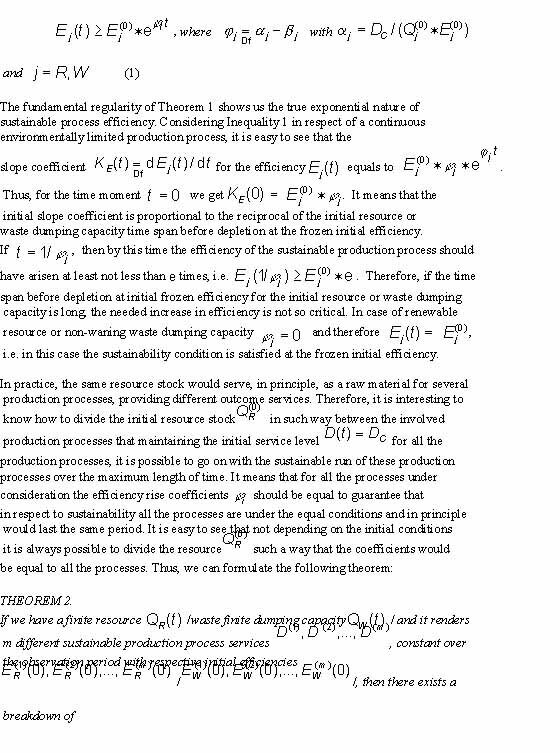 The necessary and sufficient condition for a continuous production process to be sustainable is expressed by an inequality dP(t)/dt >=0. This definition coincides very well with the classical definition of Mrs. Brundtland, telling us that the next generations should have the life quality not less than the current one, i.e. in relation to economy, have at least the same economic potential. The notion of sustainability for a production process reflects the requirements for its interaction with the ambient environment to obtain the needed resources and dispose of the waste material (it is tacitly assumed that the needed know how and the labour power for the production process is there already). For a production process, the concern is mainly limited for securing the raw material supply and having some dumping facilities for the waste. From the above given definition of sustainability follows that we can live well undaunted by the future consequences of both exhaustible resource consumption and limited dumping facilities for the waste products if we are smart enough to raise our technology level to make up for the irretrievable decrease of the exhaustible natural resources and waning facilities for dumping spin off waste products. By a casual look it may seem that the decrease of the resource or dumping space should deprive the future generations from using the resource or dumping space for some not yet invented purposes and therefore this approach to sustainability imposes some restrictions to the development. But as all the previous generations could have not had a chance to benefit by this potential opportunity, then one cannot say that the next generations have been more restricted than the previous ones. Also there is no violation of the basic philosophy of Mrs. Brundtland’s definition. The decrease of some potential for new inventions is simply the price that the humankind has to pay for the development process. But this "tax" is shared equally by all generations either belonging into the past or still to come in the future. Another apprehension concerning the decrease of the exhaustible initial resource and limited dumping space in the sustainable production process may arise from the observation that the process of decrease cannot go on forever. After a certain period, we stand in need to switch over to some new resource together with a new dumping space to be found. One very simple but impressive example of switching over to new resources to continue with development is replacement of paper in wrap up services by various kind of plastic films. It shows that sustainable development cannot be interpreted as a continuous process but instead the progress curve is a dialectical spiral. In reality, this is just the dialectical law of development, going back to the works of Georg Wilhelm Friedrich Hegel . It means that development cannot be interpreted as only a continuous evolutionary process but it encompasses many breaking points in form of revolutionary changes as well. In biology, in which the development goes by generations in explicit way, this pattern is rather obvious. Let us have now a closer look upon the mechanism of sustainable environmentally limited continuous production process. We are interested in fundamental regularities, governing the sustainable production process. It means that we are looking for some regularity that would be valid for all possible choices of sustainable production process. We start our approach with assuming that the economic potential as a function of time is constant, i.e. P(t) = Pc = const. The following reasoning is carried out for the resource-related potential component only for the sake of simplicity, as analogous reasoning can be made for waste related potential component as well. As a more practical example of a sustainable production process we are going analyse choices for oil shale based power production in Estonia, having a strong pollution effect on the ambient environment . 1. The initial exploitable oil shale resource in 1995: 666 Mt. The natural increment of oil shale deposit is marginal and would be neglected. 2. The lower calorific value of oil shale: 2.5 kWh/kg. 3. The initial efficiency of oil shale energy conversion into electric energy: 25%. 6. The annual service level 10 TWh will remain the same for the next years as well. 7. Initial efficiency of oil shale conversion into electric energy: 2.5 * 0.25 = 0.63TWh/Mt. 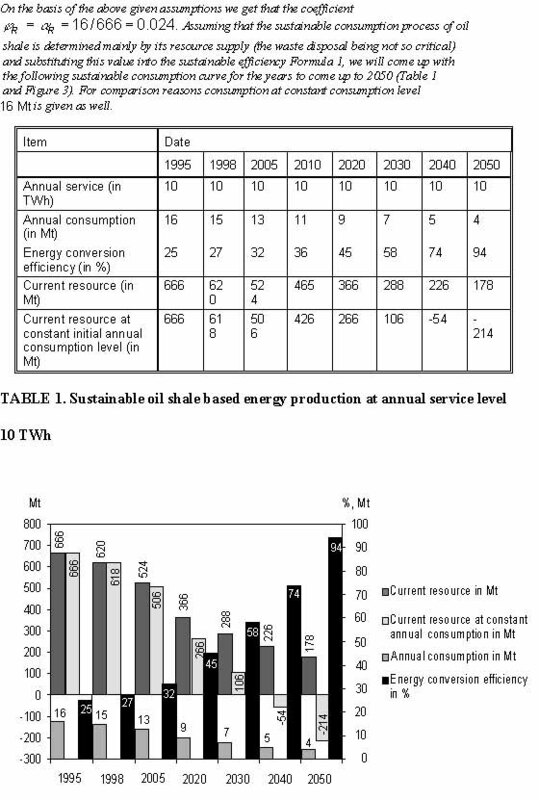 As the above given demonstrates, it is entirely realistic to follow the path of sustainable oil shale production in the future up to forty years, getting the needed rise in efficiency by switching over to co-generation technology. It would be the only justification to going on with oil shale exploitation as a fuel. As a direct conclusion of the above given Definition 2 one gets that the right to share global natural resources and dispose of waste depends on one’s contribution to the global technological progress. It means that the consumed amount of natural resource should be less than the total resource saving through the development of a more efficient production technology. High consumption level assumes a high rate of technology progress. As to the principle of global equity, everyone should have an equal access to the natural resources on the Earth, but no one has the right to use them as one may like. Limits and constraints should be put on both absolute consumption and the technology to be used. Limits to absolute consumption, described and worked up in detail in , is a necessary measure to keep the use of some resources in renewable level. But it is by far not sufficient as there are always production processes, relying in principle on exhaustible resources and therefore the needed accelerating rise in efficiency is a must. It is important to emphasise that if the total consumption in absolute value of some commodity or service goes up, it is not a sure token of the production process being unsustainable. The consumption decrease per capita due to the efficiency increase may be sufficient to guarantee the sustainability. As to the sustainable impact to the environment, it should be less than the natural restoration ability - nature should be able to restore the initial balance (the total tree cutting rate in a certain area should be less than the natural growth in that very area). Talking about sustainable economy, it is very important to emphasise that sustainable economy is nothing static that can be used outside the realm of concrete conditions, it is based on. In reality, the sustainable economy covers a dynamic process, valid only under the concrete conditions, this very economy under consideration is run. Stagnation is the worst enemy of sustainability. Putting it in a figurative formulation (reminding one of the situations in Alice’s Adventures in Wonderland ): to follow the path of sustainable development, one should be on the run all the time and not only keeping the already achieved pace, but the pace should be accelerating all the time as well. Unfortunately, a free market economy is antagonistic to the sustainable economy. In spite of the rise in efficiency based on relentless competition in a free market economy, the basic philosophy of profit hunt is such that increase in consumption rate always outmatches it and the result is anything but sustainable. In contemporary world industrial practise, may be, the only economy sector, being for sure sustainable in principle, is information technology. It is well understood, comparing, for example, the size in some dozen cubic meters of post Second World War computer processors and the size of contemporary processors, taking only some cubic millimetres of space. In other areas of nowadays economy the progress has always been accompanied with such increase in consumption and over-dimensioned energy need that the overall effect is negative in respect to sustainability. In car industry, for instance, the efficiency rise in engine operation as an highly welcomed act towards sustainability is balanced by useless engine power rise to queue up the car in a traffic jam in some overpopulated town of the Western industrial world. Sustainable economy is closely linked with the concept of information society, being characterised in terms of environmental space by high efficiency factors in respect to resource and waste dumping capacity. Following the path of sustainable economy, the efficiency factors of the economic potentials of the production processes increase steadily. Hence, the information share starts prevailing over the resource factor in the potential increasingly, and as a prospective, taking a dominant role in the potential evaluation. It means that we are approaching the information society. 1. There is no need to limit the sustainable development concept to its initial political meaning as it can be reformulated to a strict scientific notion for an economy, encompassing finite exhaustible natural resources and finite saturable waste disposal capacities. 2. Sustainability requirement is not a restriction to a true development process of an economy but just an incentive to accelerate it. 3. Making production and consumption processes of an economy economical is not enough for guarantee sustainability in the economy if it is not accompanied with a constant rise in efficiency. 1. G. H. Brundtland (1987). Our Common Future, World Commission on Environment and Development. Oxford, OUP. 2. I. Kant (1785). Grundlegung zur Metaphysik der Sitten, (IV: 421). 3. F. Cramer (1993). Chaos und Ordnung – Die komplexe Struktur des Lebendigen, Insel Verlag am Main und Leipzig, 1993. 4. E. U. Weizsäcker, A. B. Lovins, L. H. Lovins (1995). Faktor Vier – Doppelter Wohlstand – Halbierter Naturverbrauch, Droemersche Verlagsanstalt Th. Knaur Nachf., München. 5. T. Lausmaa (1999). A Sustainable Lifestyle and the Information Society, Perspectives in Human Biology, the University of Western Australia, Vol. 4 (1). 6. J.B. Opschoor, and R. Weterings (1995). Environmental utilisation space, an introduction. MILIEU, Netherlands Journal of Environmental Sciences, Vol. 9. 7. R. Weterings and J.B. Opschoor (1995). Environmental utilisation space and reference values for performance evaluation. MILIEU, Netherlands Journal of Environmental Sciences, Vol. 9. 8. Wuppertal Institute (1995). Towards Sustainable Europe, Published by Friends of the Earth, Brussels. 9. H.C. Van Latesteijn, et al (1994). Paradigms of sustainability and perceptions of environmental utilisation space. MILIEU, Netherlands Journal of Environmental Sciences, vol. 9. 10. G. W. F. Hegel (1807). Phänomelogie des Geistes. 11. T. Lausmaa (1998). Sustainable Energy Alternatives for Estonia, Renewable Energy Center TAASEN. 12. L. Carroll (1865). Alice’s Adventures in Wonderland.